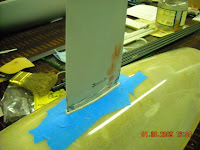 It took some salty words to remove the keel blade from the keel box that was epoxied into the hull. A bit of advice, use mold release when ever you think it may be necessary! After removing the keel blade, I cut the exposed tabs of the keel box with the Dremel cutting wheel and the used a block sander to manually sand down these tabs flush to the hull. 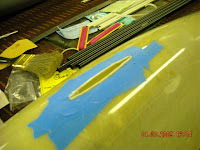 As you can see tape was used to protect the finish of the hull. Eventually more work will be required in this area of the hull/keel box joint. 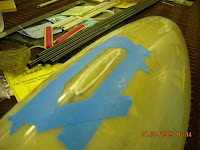 Some more epoxy with micro balloons will be needed and then a final sanding to make the fit smooth.